Five years ago, using Web mail meant putting up with flashing banner ads, spam, miniscule inboxes, and embarrassing addresses like ninjapirate73@hotmail.com. Gmail changed all that. Google’s free Web-based e-mail service offers a so-good-you-forget-it’s-there spam filter, multi-gigabytes of storage, custom addresses, and more, all for free. That’s why two years ago I moved all my personal and business e-mail to Gmail. If you use multiple computers and handheld devices (as I do), it just makes sense to have all your messages, contacts, filters, and folders in one place, where they are available from any Internet-connected device. At first, I used desktop clients such as Mail and Thunderbird to check and manage my Gmail account. But pretty soon I switched to Gmail’s Web interface, and I’ve never looked back. One big reason: an impressive collection of power tools that make me more productive. Here are a few of my favorites. Last summer Google engineers opened Gmail Labs, where they test advanced features. Canned Responses If you find yourself typing the same message over and over, you can instead type it once, save it, then reuse it as needed. For example, to opt out of mass e-mail messages, you could create a general “Please remove me from your mailing list” canned response, then insert it in a reply using the “Canned Responses” drop-down. Gmail can automatically detect when you forgot to add an attachment and remind you to do so. Forgotten Attachment Detector When you compose an e-mail that promises a document and hit send without attaching the file, this embarrassment-saver asks if you meant to attach a file first. You have to explicitly say in message text that you’ve attached a file for this one to work, and it doesn’t work every time—but you’ll be grateful when it does. Google Calendar gadget This feature puts your calendar next to your inbox, so you can view upcoming events and add new ones. Coupled with Tasks, this makes Gmail your one-stop PIM. Multiple inboxes You don’t have to stick with the default inbox view. You can instead stack additional groups of messages—all messages with a certain label, or drafts, or all messages from your spouse, for example—beside, above, or below your main Gmail inbox. This multiple inbox view is particularly effective if you have a widescreen display. Quote selected text Respond to a point buried deep in an e-mail by selecting the text, and clicking on Reply (or pressing R). Gmail will quote only the selected text in your reply for easy response. 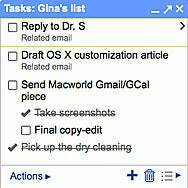 After integrating your to-do list into Gmail, you can turn messages into to-do items. Tasks One of the most mature (and requested) Gmail Labs features, the Tasks gadget adds a to-do list that integrates with Gmail. Gmail Tasks supports multiple to-do lists, sub-tasks, notes, and due dates; as in Mail, you can quickly turn a Gmail message into a task. And, because it’s Web-based, you can view, add, and edit your to-do list from your iPhone. To get all of Gmail’s Web-based features, plus the perks of a desktop client, try Mailplane ($25). It offers tighter desktop integration than your Web browser, including new mail notifications in the menu bar, drag-and-drop message attachments, Address Book access, and easy account switching if you have more than one Gmail account. Gmail’s built-in mail fetcher lets you consolidate all your POP3 e-mail accounts into your Gmail inbox. In Gmail’s Settings, on the Accounts and Import tab, click on Add POP3 e-mail account. From there, you can enter your other accounts’ credentials; they’ll then appear in your Gmail inbox. Gmail lets you reply to messages using your other reply-to address as well; in Settings -> Accounts, set up your e-mail addresses under Send Mail As. You can fetch mail from as many as five POP3 accounts at a time. The only downside: you can’t specify how often Gmail checks those external accounts for new mail. You can skip Skype or iChat entirely and chat via voice and video from inside Gmail. You’ll need a microphone, iSight or other Web cam, and the free voice and video plug-in (compatible with OS X 10.4 and above). To get that last piece, click on Settings -> Chat, click on the Learn More link, and then download and install the plug-in. (It requires Safari 3.0 and higher or Firefox 2.0 and higher.) Once you’ve restarted your browser, select the chat contact you want to call and click on Video & More to initiate a voice or video call. If you’re in your Gmail account and come across a Microsoft Word attachment, Google will let you open it, even if the machine you’re using doesn’t have Word installed. Instead of attempting to open Word documents, Excel spreadsheets, and CSV files in their native applications, Gmail offers to Open as a Google Document. Clicking on that link will open the attachment in the appropriate Google App. For those and other file types (including PDF, PPT, and RTF), Gmail will also offer to let you simply view them. The latter can be hit-or-miss depending on how complex the file contents are, but it’s a fast way to preview a document. The makers of the world’s leading search engine put some killer search tools in its e-mail product. Like Google’s Web search, you can find any needle in the multi-gigabyte haystack that is your Gmail archive using advanced search operators, including subject:, from:, or has:attachment. If memorizing arcane search operators isn’t at the top of your to-do list, enable Search Autocomplete in Labs. That done, start typing a contact name or operator, and the search box will suggest autocompletions based on your contact list and available search recipes. Managing Gmail deprives you of one (evil but necessary) feature of a desktop client: new mail notifications. You can remedy that by downloading the free Google Notifier for Mac to get Gmail and Google Calendar pop-up notifications and/or audio alerts in your Mac’s menu bar.